Looks great on the bed. Nice quality, especially for the price. Washes nicely too. I would recommend this for the college dorm and the teen bedrooms. The LUCID Comfort Collection Bed in a Bag provides comfort, style, versatility, and everything you need for a cozy night's sleep. Set comes in 4 color options and includes a comforter, pillow(s), and a white brushed microfiber sheet set. Wrinkle and stain resistant, these incredibly soft and durable sheets accommodate mattresses up to 18 inches thick and compliment both sides of the reversible down alternative comforter. 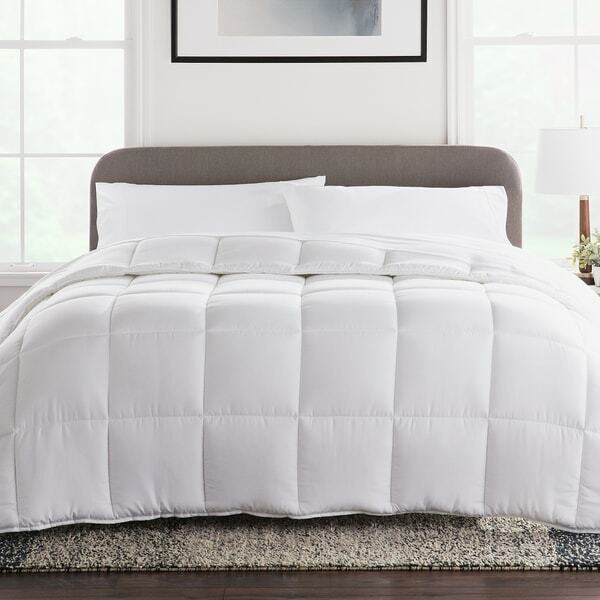 The all-season comforter has a down alternative fill finished with a box stitch design to combat shifting and clumping. With eight corner and side loops to secure a duvet cover and reversible coordinating colors, this comforter offers convenience, style and variety for an extremely versatile and cozy comforter. Down alternative pillow(s) complete this bedding set and provide the fluffable comfort of down without the odor, allergens, and sharp quills. I love this set. so soft and wonderful to sleep on. even my 2 Dobermans sneak in bed to sleep on these sheets. would be better if it wasn't a twin bed though! This set is absolutely amazing. The blanket is so warm and cozy, the pillow cases and sheets are Very soft and the pillows are fantastic!! Comes with every thing you could need and is made so well! This set is perfect. My mattress turned into a beautiful comfortable bed in minutes. So soft and so fluffy but breathable. I needed something quick for our guest room, and this price was amazing for what I received. I’m so happy I will be getting More for our other rooms. Lucid bed in bag set was everything I hoped it would be. Super soft and comfy. The pillows included with set are full size not throw like I was anticipating. Very pleased!